By week two the Overland morning routine of waking up early, taking down the tent, rolling the sleeping pads, re-packing, shoving the backpack into our truck locker has become normal. Took awhile but I am now use to it, thank god. Every morning for breakfast I have cornflakes with honey, fruit and a cup of coffee. After breakfast we take down the kitchen, clean the dishes and pile into the truck. 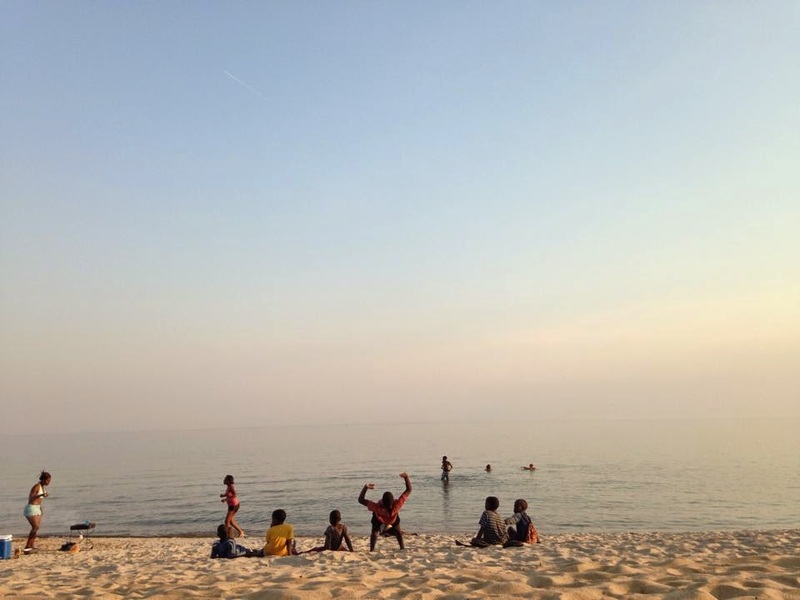 We drove six hours south from Chitimba Beach Camp to Kande Beach Camp where we, again, camped on the shores of Lake Malawi. The two days spent on Kande Beach were the most fun I have had in Africa. Lake Malawi was the perfect temperature for swimming and unlike Chitimba Beach due to bugs we were able to swim at Kande. Jess and I made our way into the water and within a few minuets about ten young boys came over for a massive water fight which turned into braiding Jess's hair. Once Jess had dreadlocks we noticed they were all naked! So many little bums diving into the water. Ha! Only in Africa. That afternoon Esther and I walked the beach and I learned how to play Boa, a Malawi board game similar to Mancala, from Jonas, a local guy who lived in the near by village. That night I fell asleep listening to a guitarist play cover songs at the campsite bar. Eight of us woke up early to watch the sunrise and eat crepes that Mike prepared for breakfast before joining a village walk through Mbaba. We met Robert, our guide, after breakfast who warned us that once we opened the Kande Beach Camp gates we would be swarmed by local guys who would walk with us. I was happy to see that Jonas was there and he spent the morning talking to me about Malawi during parts of our village walk. Robert took us to his home where casava was drying in the sun and his mother was catching little flies with a basket. She was awesome and had the best smile. Casava is a root that smells like feta cheese when drying. Once dry they make casava chips and casava wedges, which were quite tasty. Robert showed us the village well which always has clean water. We learned that Malawi is one of the poorest countries in Africa and is mainly supported by donors. Canada donated wells for every village #goCanada. After a warm welcome into Roberts home we walked to the local hospital. Two women had just given birth three hours before we arrived and were laying on hospital beds with their newborns. There eight of us were, standing in the same room watching the exhausted women rest being encouraged to take photos. It was a bizarre few minutes. The local doctor then walked us into the delivery room where he explained the birthing procedures - there are no drugs used, the hospital is free and if there are complications a larger hospital will send an ambulance, hopefully within thirty minutes. About twenty four babies are delivered every month there as it is required by law that all women give birth at the hospital in case of complications. A few days before the baby is due the mothers-to-be stay at the hospital in a waiting room. FYI, they could use medical volunteers if anyone is interested. With kids holding our hands, the village walk continued to the local school. Although it was Sunday, the principle was there to tell us about the school and their education system. Classes are taught in English and one day I would like to go back to volunteer since they are in need of teachers. Volunteering at the school is free and you would be able to stay for free at Kande Beach Camp in the bungalows. Would be an amazing experience. By the afternoon we had become friends with a handful of locals and spent the rest of the day learning how to play the drums and playing more rounds of Boa with Jonas. I was having some beginners luck and kept winning. Ha! After dinner Jess and I joined in on a beach bonfire and said goodbye as we were off to Zambia the following day.